It doesn’t seem too long ago that hybrid vehicles were first introduced around Middletown and Mechanicstown, but now there are so many to choose from. The 2015 Honda Accord Hybrid and 2015 Toyota Camry Hybrid are two top contenders, so let’s see which one is worth your money. Hybrid: Starting at $29,305,* the standard model uses the same great engine as the EX-L and Touring trims, and is equipped with advanced features, including dual-zone automatic climate control, cruise control, and even an SMS text messaging function. Hybrid EX-L: Starting at $32,055,* the EX-L makes driving not just efficient, but also easier, safer, and more comfortable. With Forward Collision and Lane Departure Warning as standard and a leather-wrapped steering wheel, this trim is a cut above. Hybrid Touring: With a Honda Satellite-linked navigation system with voice recognition and adaptive cruise control, the 2015 Accord Hybrid Touring is a technological powerhouse. If you want driving around Mechanicstown to feel effortless, this is the model for you. Hybrid LE: Starting at $26,790, the base-level 2015 Camry Hybrid also enjoys dual-zone temperature control and the most basic level of Toyota’s Entune multimedia system. Hybrid SE: Starting at $27,995, your extra money will pay for SofTex-trimmed front seats with seatback pockets and a power-adjustable driver’s seat with lumbar support. Hybrid XLE: Starting at $29,980, this is the only Camry model that gets the features you deserve from a sedan, including leather-trimmed seats. 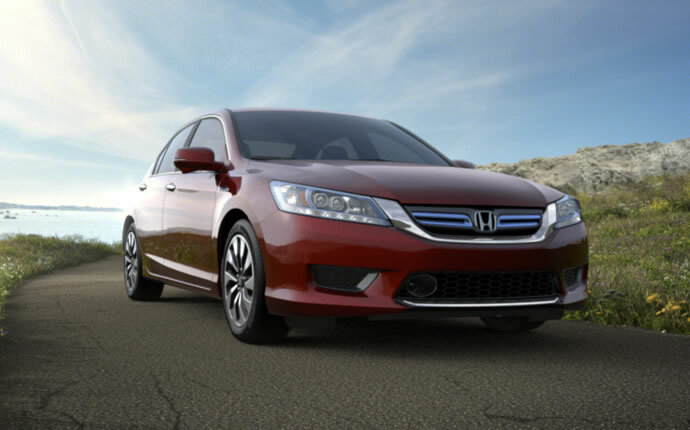 The Accord Hybrid costs slightly more, but it also gives you more. Features like navigation assistance, which is standard on high-end Accord Hybrids, will cost you extra on every Camry Hybrid trim. The 2015 Toyota Camry Hybrid and 2015 Honda Accord Hybrid use advanced performance technology to make their vehicles as efficient and powerful as possible. 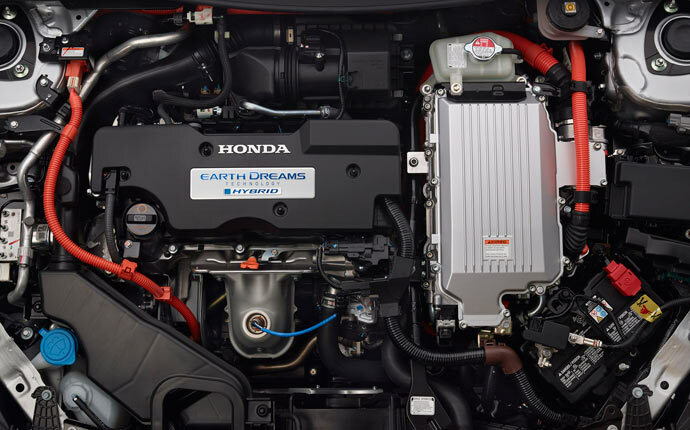 The Honda uses a 2.0L 16-valve, DOHC i-VTEC four-cylinder engine with a 124-kW electric motor. Paired together, that dynamic duo provide a total maximum horsepower of 196. The Toyota goes for a high-displacement engine, but only gets a small jump in terms of power, harnessing a 2.5L four-cylinder DOHC 16-valve engine with a 105-kW motor, for a total horsepower rating of 200. Toyota has clearly focused on the traditional engine, but by giving the Camry Hybrid a less-powerful motor they’ve missed the point of owning a hybrid: efficiency. The 2015 Camry Hybrid LE gets 43 mpg city/39 mpg highway, while upgrading to an SE or XLE will drop that figure to 40 mpg city/38 mpg highway. The interior of each vehicle is stuffed with features as advanced as the technology beneath the hood, including entertainment systems, high-quality sound systems, and Bluetooth connectivity. The main difference is the way in which each car uses its interior space. The Camry focuses on cargo capacity, and edges slightly ahead in this respect, with 13.1 cubic feet of stowing space narrowly beating the Accord’s 12.3 cubic feet. However, this is only a small difference, and Mechanicstown drivers will be asked to sacrifice their own comfort. Maximum frontal headroom, legroom, hip room, and shoulder room are all superior in the Accord. Of course, cargo space is nice, but ask yourself how many times your sedan has actually needed to fill its trunk space. Is that extra space worth the discomfort? However, Forward Collision Warning and Lane Departure Warning systems are offered as standard on some Accord Hybrid trims, whereas they’re only available at added cost for Toyota’s customers. Middletown drivers will find that there are also several pieces of technology that are improved in the Accord Hybrid. 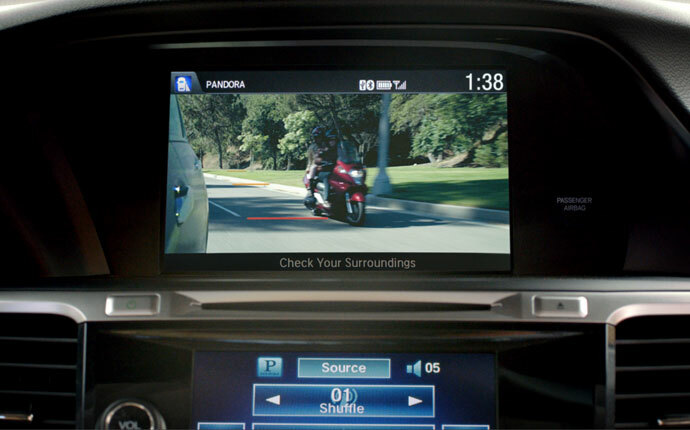 For example, the Camry has a rearview camera, but the Accord Hybrid has a multi-angle backup camera. The 2015 Honda Accord Hybrid provides more features, more safety, and lets you go farther on a single tank than the 2015 Toyota Camry Hybrid. Honda has clearly understood what Mechanicstown drivers need, and the result is a superior vehicle. For more information, contact Middletown Honda today. *MSRP excluding tax, license, registration, $820.00 destination charge and options. Dealer prices may vary. **50 city/45 highway/47 combined mpg rating. Based on 2015 EPA mileage ratings. Use for comparison purposes only. Your mileage will vary depending on driving conditions, how you drive and maintain your vehicle, battery-pack age/condition, and other factors.